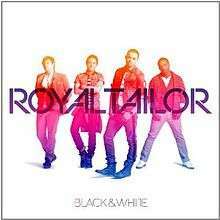 Black & White is the first full-length studio album released by the Christian pop/rock band Royal Tailor. The album was released on June 7, 2011 by Essential Records and distributed via Provident Label Group. This album received a nomination at the 54th Grammy Awards for Best Contemporary Christian Music Album. ↑ Johnson, Jared (June 7, 2011). "allmusic review". Allmusic.com. Retrieved December 10, 2011. ↑ Faulkner, Jonathan (July 8, 2011). "Alt Rock Live review". AltRockLive.com. Retrieved November 6, 2012. ↑ Aspinwall, Grace S. (September 1, 2011). "CCM Magazine review". CCM Magazine. p. 42. Retrieved October 22, 2013. ↑ Morgan, Clay (June 7, 2011). "CBN review". Christian Broadcasting Network. Retrieved October 22, 2013. ↑ Holden, Tim (July 27, 2011). "Cross Rhythms review". Crossrhythms.co.uk. Retrieved December 10, 2011. ↑ Gelwicks, Roger (June 7, 2011). "Jesus Freak Hideout review". Jesusfreakhideout.com. Retrieved December 10, 2011. ↑ Davies, Jono (May 31, 2011). "Louder Than the Music review". Louder Than the Music. Retrieved October 22, 2013. ↑ "New Release Tuesday review". Newreleasetuesday.com. Retrieved December 10, 2011. ↑ "Complete List of Nominees for the 54th Annual Grammy Awards | E! Online UK". Ca.eonline.com. November 30, 2011. Retrieved January 14, 2014. ↑ "Royal Tailor – Chart history" Billboard 200 for Royal Tailor. Retrieved October 22, 2013. ↑ "Royal Tailor – Chart history" Billboard Christian Albums for Royal Tailor. Retrieved October 22, 2013. ↑ "Royal Tailor – Chart history" Billboard Independent Albums for Royal Tailor. Retrieved October 22, 2013.